The single largest cause of damage to PV systems is without doubt lightning and induced surges. There is a connection between solar radiation, air humidity and the frequency of lightning discharges. The regional lightning flash index (strikes per km²/year) and the location and size of PV plants will determine the risk of damage and downtime to the free-field PV farm. With the completion of round one of the photovoltaic (PV) farm rollout in 2015, the astronomical amount of damage caused by lightning to various PV farms made it clear that the proper lightning and surge protection measures were not employed on these free-field PV farms. Damage to PV systems can be caused by both the destructive effects of direct lightning strikes, as well as by inductive or capacitive coupling caused by the electromagnetic lightning field – in other words, by nearby strikes. In addition, switching surges on the upstream AC system can also cause damage to PV modules, inverters, charge controllers and their monitoring and communications systems. Fig. 1: The air termination system forms a critical part of the external lightning protection system. In the case of an uncontrolled lightning strike to the PV system, lightning currents will be induced into the electrical installation and cause severe damage to the system. There are also the much higher risks of fire due to the fact that a large portion of the free-field PV system uses DC currents which do not disconnect under fault conditions. The cost of repair and the loss incurred by downtime must be taken into account. There are also various other factors such as the premature ageing of the PV components and the risk of not meeting contractual requirements in terms of generated power. The risk of damage caused by lightning must be determined in accordance with SANS/IEC 62305 Part 2, whereby the results of the risk analysis must be considered at the design stage. In addition, in IEC 62305 Part 3, a minimum lightning protection (Level III) is specified for all PV systems greater than 10 kW. It must be therefore be considered “good practice” to employ the proper earthing, lightning and surge protection systems. The installation of non-compliant/sub-standard lightning protection systems to save on the initial PV farm build cost will result in damage and downtime of the PV system and, in the medium to long term, be far more costly. Air termination and down conductor system. Surge protection system to power supply and data systems. These elements form the complete lightning protection system, with the parameters of each element derived from the selected lightning protection level, obtained from the lightning risk assessment process. Fig. 2: The umbra and penumbra the effects. A properly designed air termination system will prevent direct lightning strikes to the PV plant’s electrical systems. All electrical systems, including the PV panels, must be located within the protection zone of the air termination system. The air termination system must be designed in accordance with the parameters of SANS 62305 Part 3 and, as a minimum, the air termination design should be based upon a lightning protection Level III system. The rolling sphere and angle of protection methods are generally employed for an air termination system that protects a PV array (see Fig. 1). When designing the air termination system, care should be taken that no solar panels are shaded by the air termination masts or rods. iffuse shadows caused by distant masts or rods do not affect the PV system or their yield negatively. Core shadows, however, cause stress to the PV cells and this leads to bypass diodes. The required distances from the air terminals must be calculated. 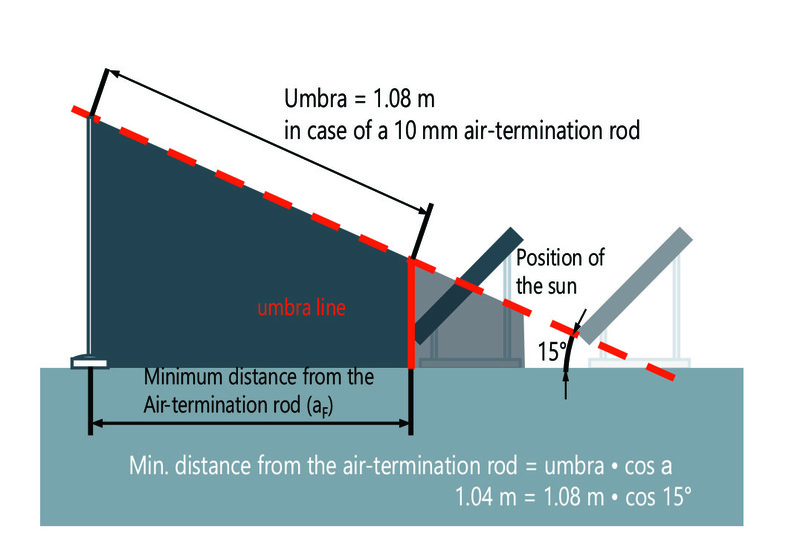 For example, the calculated minimum distance from a PV module of a 10 mm diameter air terminal is 1,08 m.
The region of the PV module which is completely obscured or shaded is called the umbra and should be prevented in all cases (see Fig. 2). The area known as the penumbra, or diffuse shadow, is partly obscured since the air terminal or conductor only covers the sun partly. 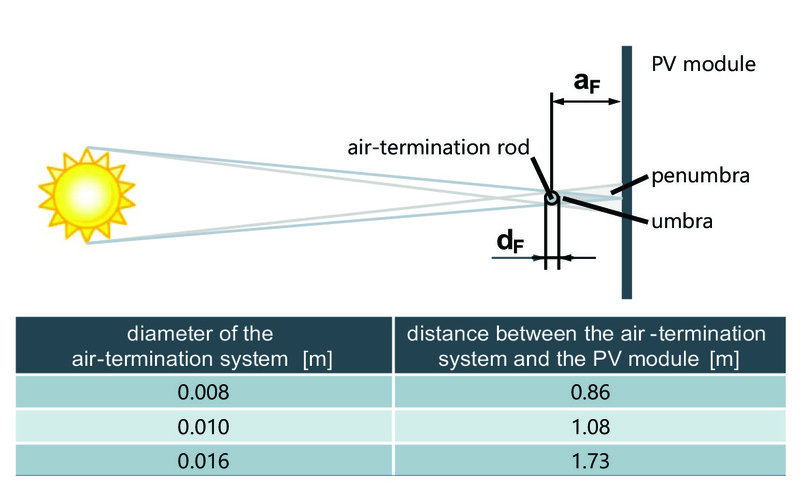 The minimum distance required to prevent an umbra can be calculated depending on the dimensions of the air terminal or conductor (see Fig. 3). 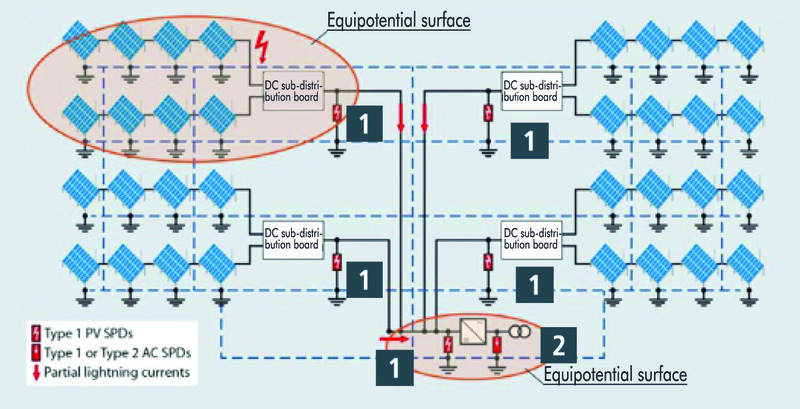 The earth termination system forms the basis for effective surge and lightning protection on PV power plants. The design and installation of a properly formatted earth termination system is therefore critical in providing effective protection against lightning and induced surge currents. Annex D of Supplement 5 of IEC 62305-3 specifies a meshed earth termination grid ranging from 20 x 20 m to 40 x 40 m in size (see Fig. 4). This type of grid earthing system has proven effective in practice. Supplement 5 also specifies that all metal PV module racks be interconnected. The installation of the grid-type earth termination system allows for this required bonding. Fig. 4: Earth termination system according to IEC/SANS 62305-3. By intermeshing the earth termination systems, an equipotential surface is created across the site, considerably reducing the voltage stress on the electrical connecting lines throughout the plant and operations building. Large portions of the earth termination system are frequently installed in the cable trenches. Where this is done, the routes must be closed to form grids. 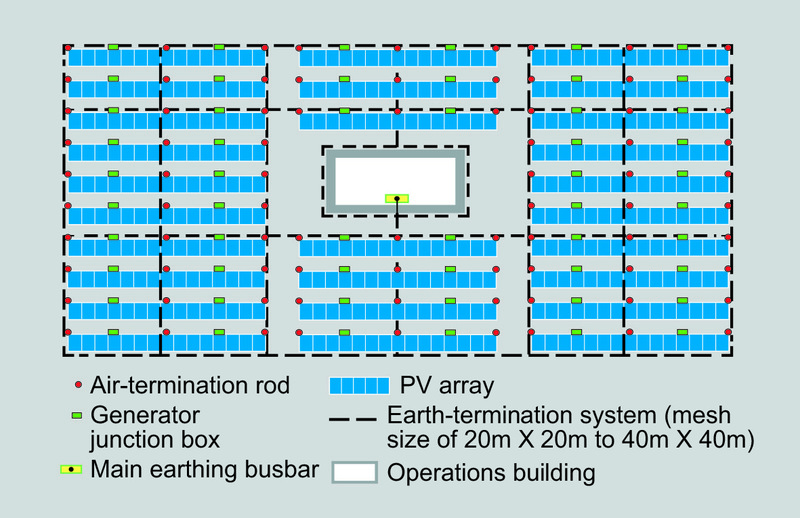 The metal framework for the PV modules must be connected to each other and to the earth termination grid. Metallic piles can also be used as natural earth electrodes, provided that they are made of material and with wall thickness in accordance with the minimum requirements of IEC/SANS 62305-3 (see Fig. 5). 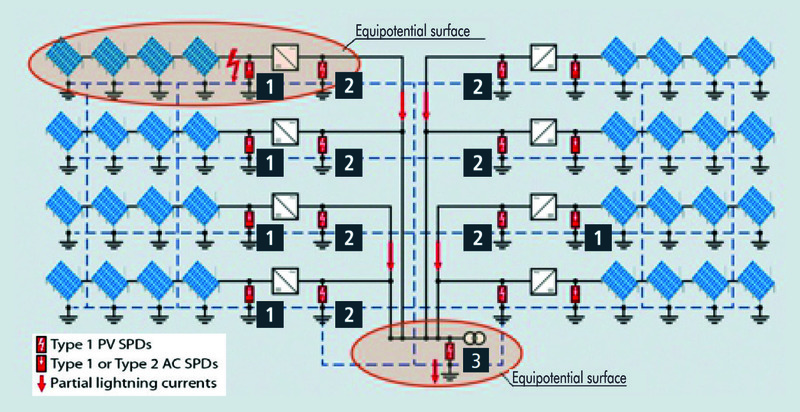 Each PV array must be interconnected in such a way that it can carry lightning currents. Second to the installation of a grid-type earth termination system, the correct equipotential bonding is of vital importance to providing effective protection to PV plants. The installation of the proper grid-type earth termination system provides the right infrastructure for the effective equipotential bonding system. between air and earth termination systems. Lightning equipotential bonding means connecting all metal systems directly so that they can carry lightning currents. This would include all cabling and electronic systems. These electronic systems are bonded equipotentially into the lightning protection system by means of lightning current arresters or surge arresters. All cables must be routed so that large conductor loops are avoided. This applies to single-pole series connections of the DC circuits (string) and to the interconnection of several strings. In addition, the data or sensor lines must not be routed across several strings to form large conductor loops with the string lines. For this reason, power (both AC and DC), data and the equipotential bonding cables must be routed together as far as possible. Surge protection devices (SPDs) must be installed to protect electronic systems in PV power plants. If lightning strikes the external LPS of a free-field PV system, high voltage impulses are induced onto all electrical conductors and partial lightning currents will then flow into all copper cables (AC, DC and data cables). The magnitude of the partial lightning current depends on various factors such as the type of earth termination system, the soil resistivity on the site and the type and size of the cables. Supplement 5 of IEC 62305-3 requires a minimum discharge capacity of 10 kA (10/350 μs). For voltage-limiting type 1 DC SPDs, this requirement takes into account the possible reverse currents that could occur. In PV systems with central inverters, fuses protect from reverse currents, but these fuses only trip after some minutes. When dealing with DC currents in PV plants, surge protection devices installed at the generator junction boxes must therefore be able to handle the total current consisting of both the operating and reverse currents in order to reduce the risk of arcing. The SPDs must ensure automatic disconnection without arcing in the case of overload (see Fig. 6). PV arrestor depending on the time of day. The typical curve characteristics of photovoltaic current sources differ substantially from conventional DC current sources. They have a non-linear characteristic and different DC arc behaviour. These differences not only affect the size of the DC switches and fuses, but they require surge protection devices able to cope with these unique DC follow currents. Supplement 5 of IEC 62305-3 requires safe operation of surge protection devices on the DC side, even in the case of overload. The lightning current is mostly dissipated into the ground via a properly designed earth termination system (grid type) and only a small partial lightning currents dissipate via the PV system`s cables which are equipotentially bonded to the earth termination system via SPDs, this happens for both low resistance and high resistance earth termination systems. It is, therefore, the shape and dimension of the earth termination that is important, not the earth termination resistance. Fig. 7: PV system with central inverter. Central inverter: A great portion of lightning current that enters the earthing directly, as well as partial lightning current, also seek a path to earth via the DC cabling. The assumption that the whole surface of the PV system can be considered an equipotential surface is not realisable in practice. The energy system cables work as equipotential bonding conductors between the “local” earth termination at the module array where the direct lightning strike occurs, and the “distant” equipotential surface of the central inverter. Therefore, in PV ground-mounted systems with central inverters, the partial lightning currents flow through the DC conductors between the generator junction boxes and the DC input of the central inverter. Type 1 PV SPDs must be installed at both the DC sub-distribution boards and at the DC input of the central inverter (see Fig. 7). String inverter: In the case of string inverters, the power supply cables act as equipotential bonding conductors between the “local” earth termination of the PV array which was hit directly by lightning and the “remote” equipotential surface of the infeed transformer. Partial lightning currents flow on the AC lines, hence the installation of Type 1 SPDs on the AC side of the string inverters, and on the LV side of the infeed transformer. Type 2 SPDs, which mainly limit induced interference impulses, are sufficient on the DC side of the string inverters (see Fig. 8). Fig. 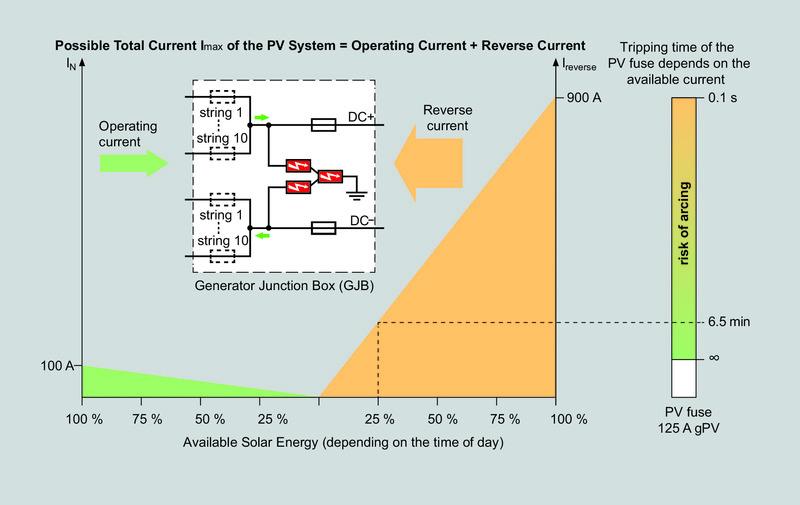 8: PV system with string inverters. The ability to obtain reliable data from remote maintenance equipment via data cables is essential to the effective operation of a PV plant. It is therefore important to provide adequate surge protection to these data systems to prevent damage to the system. The string and inverter monitoring system, weather data acquisition unit, anti-theft protection and external communication system are based on different physical interfaces. Surge protection devices specifically suited to each type of interface must be selected. South Africa’s high lightning flash indexes, coupled with the large size and vulnerability of free-field PV power plants, makes the correct design and installation of lightning and surge protection systems imperative. Proper lightning and surge protection for all systems provides enhanced power plant performance. Service and maintenance time, as well as the cost of repair and spare parts, are also reduced. DEHN lightning and surge arresters, with their patented SCI disconnect technology, are recommended for PV power plants. The SABS Standards Committee has not yet adopted Supplement 5 (2014) of IEC 62305-3, but the author believes it can be considered as good practice and recommends the use of this supplement. DEHN: Lightning Protection Guide, third edition. SANS 62305-1, 2, 3 and 4.